Brett Roth's Insight Into Windows, Doors & Coating! A major incentive for homeowners to replace their current windows and doors is to obtain the government’s energy tax credit that was signed into law in the American Recovery and Reinvestment act earlier this year. With a rebate of up to $1,500 for the cost of materials many homeowners are trying to earn this credit. However, the wording of the bill is not extremely clear cut, and there are some tight regulations that need to be met in order to become eligible. This entry aims to highlight the requirements so that everyone is clear on what criteria their new windows and doors need to meet in order to reap the benefits of this program. An easy way to remember what ratings a window needs to have is to remember 30/30/30. 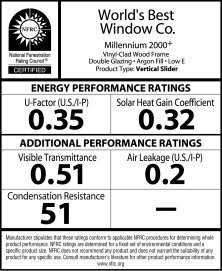 These numbers are the U-Factor of the window, the SHGC (Solar Heat Gain Co-efficient) and the percentage of the rebate on materials (up to $1,500). The U-Factor of the window must be equal to, or below 0.30. Likewise the SHGC must also be equal to or below 0.30. Click on the image to view further details. Both of these numbers can easily be found on any window on the stickers that show their specifications. If you do not see these stickers on a window, DO NOT BUY THEM! It is important that these stickers remain on the window until after installation and inspection. They are needed for documentation in order to earn the rebate. FAS Windows & Doors is committed to bringing quality products to the community and carries many products that meet the needs for the energy credit. If you are already in the market for windows, or if the opportunity of knocking off $1,500 of the material costs of windows has enticed you to start looking at some replacements, remember the 30/30/30 rule and please come by our showroom or call us at 888-422-1960 to set up a FREE in-home estimate for a quote.